We here in the DALS house are going to be traveling a bit over the next week or so, and I’m not entirely sure how much I’ll be able to chime in while I’m away. (I reserve the right to change my mind.) So here is a little round-up to hold you over til we return. Have a great Fourth and Happy Summer! A guide to 1600 swimmin’ holes (dropping the ‘g’ is required, says my husband) across the US and Canada. With this news, Grand Central Terminal, perhaps my most favorite building on earth, just became my favorite-ist to the hundredth power. Everything tastes better when these string lights light up the patio table. Before I travel to any major city, I pretty much always check the BA Weekender Guides at Bon Appetit — where to eat, stay, visit — and they’ve never failed me yet. We are not soda people in general, but if we were, our fridge would be stocked with this all summer long. Andy has had this on repeat all week, and as far as I can tell, he shows no signs of letting up any time soon. No such thing as too young when it comes to reading aloud to your kids. Two Oldies but Goodies for the Grill: Pork with Peaches and Tony’s Steak. No doubt you’ll be throwing some dogs on the barbie this holiday weekend. 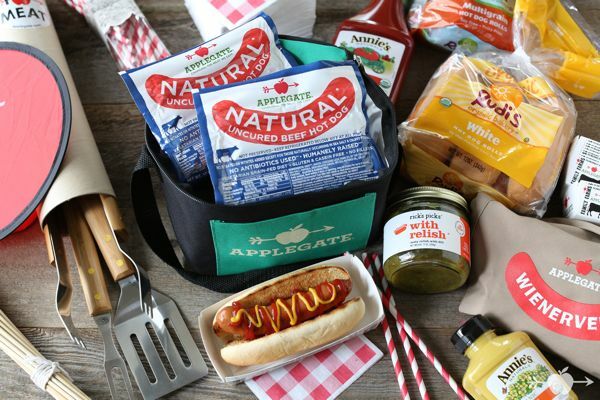 To celebrate this decidedly happy occasion, and to call attention to their “What’s in Your Hot Dog” campaign, Applegate has offered to give away “Weinervention Kits” (hot dogs, buns, relish, grill tools, and everything else) to two lucky DALS readers. Just leave a comment below to be eligible. (It wouldn’t hurt if you shared what you’re grilling for the Fourth — hot dogs or otherwise.) Contest ends Saturday, July 5 at noon ET. UPDATE: THE WINNERS HAVE BEEN NOTIFIED. THANKS TO EVERYONE WHO PLAYED! All photos up top taken at Rye Playland in Rye, NY. Great roundup! We will be grilling hot dogs, hamburgers, and bacon wrapped scallops for the 4th! Grillin’ hot dogs and hamburgers for the 4th — as long as Arthur stays away from the VA coast! Good stuff. Hot dogs, hamburgers and baked beans for us. Burgers and dogs here! Happy 4th! The fourth of July is my baby’s (1st!) Birthday, so we’re grilling burgers, but what I’m most excited about is the cake! We aren’t in charge of the grill, but I plan on making some cold peanut noodles to add to the table, and probably a pie as well. No grilling for us as we will be @ a water park! Also, link to your mini-slideshow goes to dead page. We are grillin chicken bratwurst (it is almost a requirement — we are from Wisconsin and have a strong German heritage) and hotdogs for the kids that don’t care for brats. Happy 4th! PS: FYI: I received your error page when I tried to view your mini slide show. Always grillin’ hot dogs. They are my fave! And your link to the strawberry shortcake inspired me to maybe try a spin on that. The usual – hotdogs and burgers. A friend of mine said that avacados are sensational on the grill so we’ll be trying that out too! I have never heard of Applegate, but I just looked them up, they sell near me, Im going to have to give them a try, looks like good stuff, thanks! We’re grilling chili cheese dogs! Planning to serve watermelon and 7-layer taco dip with chips along side, and fruit pizza made to look like a flag. We’re grilling fish and shrimp, but I would love a reason to try these Applegate hot dogs!! we will grill hot dogs and farmers market sausages! Corn! love grilled corn, with compound butters. we’re actually not grilling (gasp!) but doing a fish fry! Love this round-up — the rose sangria sounds awesome, and there are so many other links that I want to check out. My kids would love you if we won a Weinervention Kit, because I rarely let them eat hot dogs. We’re planning on grilling shrimp and burgers. Thanks for the opportunity! It’ll be burgers for us on the 4th! Yay to a giant Nordic food hall and rosé sangria. Enjoy your 4th of July! We’ll be doing a mix of fish tacos (horrible naming convention) and hotdogs with kraut, guacamole and sriracha mayonnaise — or as it’s commonly known “el completo”. The first step is admitting you have a problem…I need a weinervention!! Sadly no grilling, but lots of board games! We are grilling cheeseburgers, hot dogs, and please help me, this gigantic pork shoulder I have no idea what to do with! I will be making rose sangria and fancy deviled eggs too. Happy traveling and happy fourth! Won’t be grilling on my own, but will likely be attending my favorite bar’s cookout. Probably fancy sausages and burgers. Since I will be at the end of a 12 hour shift in labor and delivery, I won’t be grilling anything. But I’m sure hoping my husband will have some sort of brats (meat, not children) on the grill! I’m making ribs on the 4th! Bacon-wrapped shrimp and Tony”s steak! burgs and dogs…always….with interchangeable sides…I found a great orzo spinach salad recipe…cheers! Hot dogs are my favorite things to grill. I mean, steaks? Pork chops? Sure but you can go wrong in so many ways? A grilled hotdog? Man, it’s just so simple. Even if you burn it, it’s still frikkin’ delicious! Awesome links, as usual! We’re not grilling anything around here for the 4th, as we’re Canadian, but did some hot dogs and chicken for the 1st! I’m not grilling but I am making a blueberry pie! We’ll just be grilling the usual – hot dogs, brats & burgers. We live in Maine so the 4th brings lobsters steamed in seaweed on the beach. We’ll be grilling butterflied honey-mustard-rosemary marinated pork tenderloins. Yum! For us it will be a crab boil for the adults and hot dogs for the children! Can’t wait! Bison dogs for the 4th! With a spicy mustard and caramelized red onion… there so good! Yum, I’d love to win this as I do love me some hot dogs. This 4th, my family will actually be having our annual LobsterFest. We’ve never done it on 4th of July before, but it’ll be a nautical lover’s dream- blue and white and lobster! BBQ chicken for us! Accompanied by slaw, salads, and tons of watermelon! We grilled peaches last night — delicious! Not sure what we are grilling but there will be plenty of great family, which is my favorite part anyway! Eating grilled burgers at our aunt and uncle’s house, but I hope to throw some pineapple on the grill for extra fun. 🙂 THANKS for the giveaway!!! we are going to smoke some ribs. It’s gotta be burgers and dogs. Maybe some ribs. Who knows, we are going to a neighborhood block party! Pork tacos. Would love this! Grilling chicken, cheddar stuffed bratwurst, and fruit kebabs! We’re grilling burgers with friends as well as these veggie and halloumi skewers! Some kinda fish, as we love grilling fish in the summertime! Greek Yogurt Chicken, hot dogs and CORN! Yum! Can’t wait to grill some hot dogs and stuffed hamburgers over the 4th! I love the idea of Weinervention! We’ll probably grill up some brats. having a classic cookout for the 4th! Have fun traveling! We’ll probably grill up some pork tenderloin – yum! yes!!! we just bought similar globe lights for our patio from amazon (some that were slightly more $$, but got awesome reviews). practically living outside these days….and headed to a lake for the 4th where we are grilling ‘dogs and taking along chicken marbella (http://www.epicurious.com/recipes/member/views/CHICKEN-MARBELLA-SILVER-PALATE-COOKBOOK-1277030) for the rest of the weekend. cheers! We will either be grilling Applegate hotdogs or brats from our co-op. And we’ll be having plenty of watermelon and lemonade, our kids’ favorites. Not grilling-camping so we will be making smores of course! We get to have TWO celebrations! On the 4th we will grill burgers and hotdogs and chicken breast. On the 6th we will have pulled pork and grilled pork ribs. I know, it’s two of nearly the same, but can you believe I have family that will not eat the ribs because of the bones. I know! Always burgers and dogs on the 4th! Happy vacation!!! 🙂 I’m hoping to do our fav summer ribs this weekend. Hot dogs and hamburgers are on our menu for sure! we just grilled up fresh s.carolina shrimp at kiawah this week… and probably some kind of pork and grilled peaches on the 4th! hooray for summer! Strip steaks for the adults and hot dogs for the little ones – love everything about the Applegate products! We’ll be grilling turkey burgers with feta, and hopefully some peaches to have with ice cream. This is a great reminder for the BA weekender guides – I also love the Eater 38 guides for most major cities. They have almost never let me down and they are also incorporated into Foursquare so you can see which of their recommended stops is nearest to you at the time. I’ll be at my parents’ house and I hope they are making brats!! We’re grilling flank steak for salad for just a small group of four adults and two toddlers. But we love Applegate hot dogs! My favorite kind of “soda”. Safe travels! Yum! Applegate hot dogs will be on the grill for sure! We’re grilling steaks, hot dogs and corn on the cob slathered in butter. I don’t know,.. I guess probably nachos and rootbeer our default vegetarian Friday food. Chicken dogs, fruit salad and sour cream cucumbers! Have to try the Pelligrino, yum! Hot dogs without corn syrup? Sign me up! We are eating at my Grandmama’s on the 4th but will be grilling Saturday! I made Tony’s Steak last week and it was a winner as always. Leftovers, if there are any, are great with eggs for breakfast or for lunch as fajitas. Love those triple duty recipes! We’ll likely be grilling burgers for the Fourth. You should repost on the 4th! Doing a seafood boil for my Mom – her fave. I am grilling DLS baby back ribs for the forth! Yum, Applegate dogs are our favorite. We will be celebrating the holiday weekend with lobsters on the lawn, in which we order steamed lobsters from the grocery store and serve them with salad and potato salad. No fuss decadence! Going to a party, so I don’t have to cook, but thinking I might need to bring the old standby: deviled eggs. Thanks to DALS, I’ll be garnishing them with something fun! Grilling up burgers and hot dogs. There’s nothing better than a nice (hot)dog with mustard and ketchup! yum! Especially when they’re the good ones! I just received a Praise the Lard box from Zingerman’s (happy birthday to me!) so it will certainly be something that involves bacon. Oh! We are big fans of all things Applegate – and would love to win this prize and extend our summer of fun. My cousins will be grilling hot dogs,sausage and burgers. Growing up, we always had Cornell chicken in the summer – might have to grill some up for the 4th. My 7 yr old needs a new dog in town — she’s starting to rebel against the chicken and turkey. As for grilling, we haven’t even started yet this summer — poor showing for us! I don’t know what we are having yet. Yikes! We are smoking a pork roast for pulled pork sandwiches. We will be grilling ribs, roasted garlic chicken sausages, bell peppers, onions, and corn on the cob! Kind of hot in the AZ sunshine at lunch time so we are making pulled pork in the crockpot with Pioneer Woman’s spicy pasta salad-yum!!! Would love to try the hot dog grilling kit! Since the 4th also celebrates the birth of my pa, we’ll be celebrating himself with some steaks and some corn. It’s time for good corn. the first thing i ever tried making was chicken and believe me it was fab!!!! I’ll be staying with a friend out of town, so no word yet on what we’re grilling! In my perfect world, it’d be a big batch of hatch chili peppers. My husband sure lives his fire! As long as I’m not cooking, menu is fine with me! I may suggest shrimp or fish, though, and portobellos. Not sure what we’ll be grilling tomorrow – that’s the hubby’s department. But I just read Bittman’s recipe for the sour cherry old fashioned and it had me thinking at 845 am that it must be 5pm somewhere…. Thanks for the great roundup! Planning to grill St. Louis style pork steaks but that pork and peaches looks good too. I’ll be eating a sandwich.. at work (children’s hospital). Hopefully, will be grilling this weekend though (shrimp! bread! asparagus! ), however, I’m also on call. Sick kids don’t take days off…. Weinerintervention will take place with dogs, brats, and burgers! Some corn will be grilled and put in a salad with cherry tomatoes grilled peppers and a yummy vinaigrette. We’ll be putting some chicken and hotdogs on the grill to chow down before the fireworks. Hubs just got a new grill, so it’s dogs and brats tonight, burgers tomorrow. Some sort of slaw and/or pasta salad on the side for both nights. And s’mores, obv. For Father’s Day, I gave my husband a mint condition 1991 cherry red Weber gas grill that I found in a FREE PILE! Woot! We’ll surely be having dogs on the grill and your eggy potato salad! We are in Alaska for the 4th so most likely grilled shrimp and salmon. We’ll be having smoked ribs for the 4th. Have a great holiday! 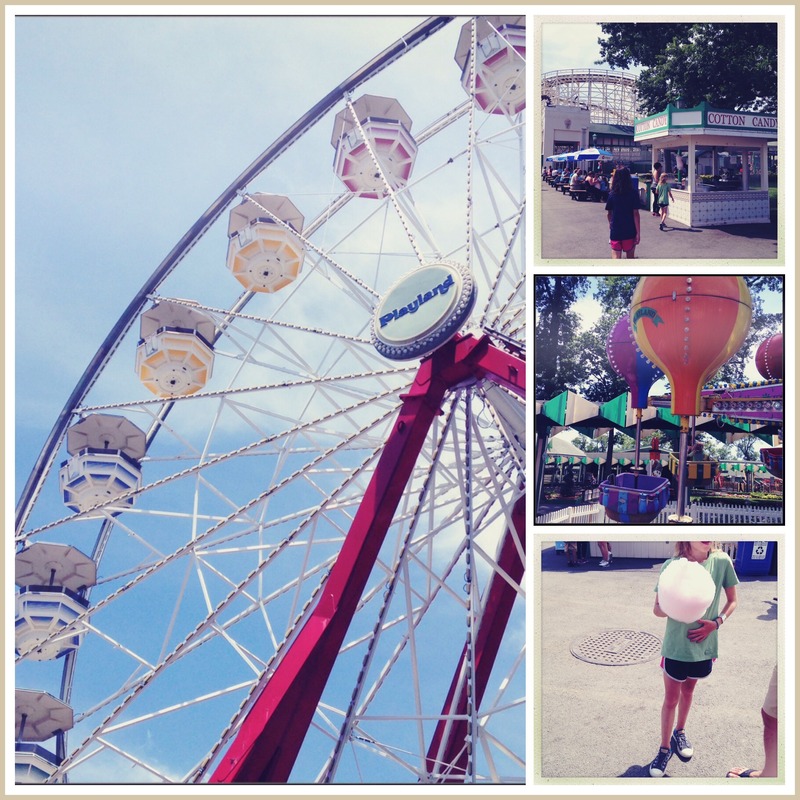 Rye Playland!!!! My husband and I used to live in Harrison, so we know it well. Ahhh, memories. Is that little cafe-diner close by still there? We’ll be grilling various meats and veggies for the adults, and hot dogs for the littles…and some adults, I imagine. We are grilling with friends. I’m sure hot dogs will be on the menu! Hot dogs will definitely be on our grill this weekend! We will be grilling Salmon for the holiday, probably under big umbrellas with the heavy rains coming up the east coast. Please keep sharing with us the books your girls enjoy. I have two avid readers and the new ideas help keep it fresh. When we have Hot Dogs -often, they are only & always Applegate! yum! Grillin’ peaches and pork. …And hoping to win that very nice prize! We’ll be grilling burgers and brats over an open fire at my cottage. Yum! We’ll also being eating your kale salad and the Cafe Chicken recipe you posted the other week. Love your posts! My brother is smokin’ ribs! Brats, ribs and chicken will grace our grill this weekend. Hot dogs and hamburgers and finishing up with s’mores! We’re probably going to have bison burgers — and potato salad, of course! Fun giveaway! I’ll be cooking up some pork chops. We are grilling up some inside out burgers and corn on the 4th! Love the roundup and the basket of yum! The dogs and I will be grilling salmon, corn and asparagus—everyone’s favorites! Hamburgers, hotdogs, corn and other veggies! We’re grilling bone in brined pork chops and garlic olive oil gulf shrimp. Roasting beets and summer squash. Serving salad fresh from the garden. mmmmm. We will be grilling pork steaks, because I grew up in St. Louis and in St. Louis you grill pork steaks all summer long. Enjoy your travels! We’re grilling skirt steak and corn! No grill, so barbecue chicken pizza over here. We’ll be grilling ribs, barbeque chicken, corn, and-my personal favorite-crab legs! My daughter wants free mustard! Mu husband will be working the farmers market all weekend to help make sure everyone else gets their corn and peach fix. I’m hoping we can squeeze in some grilling of our own. Since I’m 7 mo pregnant having some dogs that are not a mystery mix would be great! Making a cake & blackberry tart. Applegate, the only hotdogs I’m able to eat with my allergies. I’m loving grilled pineapple this summer so we’ll definitely have some of that! I’m loving grilled pineapple this summer! Actually, we’re not grilling anything for this July 4th. I know, I know; un-American!! BUT, my husband is stuck working today so we figure we’ll celebrate next week. Instead, I’ll tell you what we last grilled: BBQ Chicken! BBQ chicken, possibly Alabama style! We will be grilling apple or pineapple sausages. Given the choice, my children would eat Applegate hot dogs for lunch and dinner every day, no holiday necessary! Happy 4th! Leaving a comment–hoping to win! I haven’t had a hotdog in a million years and have had a wild craving for one. Perfect timing! Love the round up posts! Grilling salmon tonight! Keeping it simple tonight with grilled brats & dogs! I did enjoy one of my dogs with cream cheese…mmmmm! Korean short rib, Mexican corn, and bacon wrapped squash! We made the picnic chicken from your previous post. It was perfect for the holiday. Hot dogs will be today. Turkey burgers and un-cured hot dogs for us. I’ve been wanting to try applegate dogs from our brand new TJ’s in winter park, FL! Family reunion yesterday had us bringing cold fried chicken, napa cabbage cole slaw and blueberry bars as our contribution. Although I ate many more items than those three. Still full from burgers, deviled eggs and flag cake. Love the 4th! Last night, we grilled hot dogs, obvs! Topped ’em with guacamole, shredded cheese, chopped onions and smoky pepper sauce. Smiles all around! My new favorite way to eat a hot dog is wrapped in bacon with grilled onions and chopped avocado. So delicious! It has to be a high quality dog though! My girlfriends and I share blogs we enjoy with each other. I’m glad I found your blog. I’m a big follower of “Smitten Kitchen” and “Cooking With Mr. C.” I will now send my friends your link. I’m a mother of 5 and have to keep things interesting. Bonnie L.